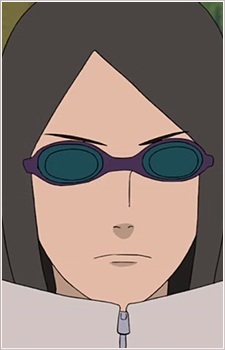 Muta had long brown hair and like all other Aburame, his eyes were obscured by dark sunglasses. His attire consisted of a long sleeved light tan jacket with a high, upturned collar. The remainder of his form was largely obstructed by the low hemlines and overlaying clothes. He also had a pouch fastened to the back of his outfit which he used to carry around a jar in which he carried additional Kikaichū bugs.